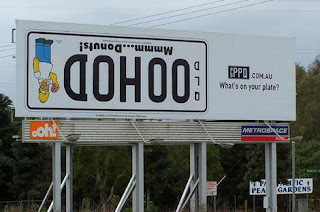 A CairnsBlog reader north of BrisVegas told about the drama going on about a highway billboard that went up this week. The RACQ wants the Ipswich sign removed, or at least put up "the right way" because they believe it's a hazard. "We're horrified that Personalised Plates Queensland are behind this campaign to sell car number plates on behalf of Queensland Transport," they told Brisbane Times. "It will cause distraction. People will turn their necks to try to understand it," the humour-less RACQ says. However PPQ doesn't think it's a distraction, and believe it's just a clever bit of marketing. "It's a bit of fun. No one complained when we displayed these elsewhere."